Browsing articles tagged with " suspension"
Compton, California (April 9, 2015) – Today it was announced that Daystar Products, a leading manufacturer of suspension components and polyurethane products for cars, trucks, and SUVs, has returned as a key sponsor of Greg Adler Motorsports and the Team 4 Wheel Parts off-road racing team. 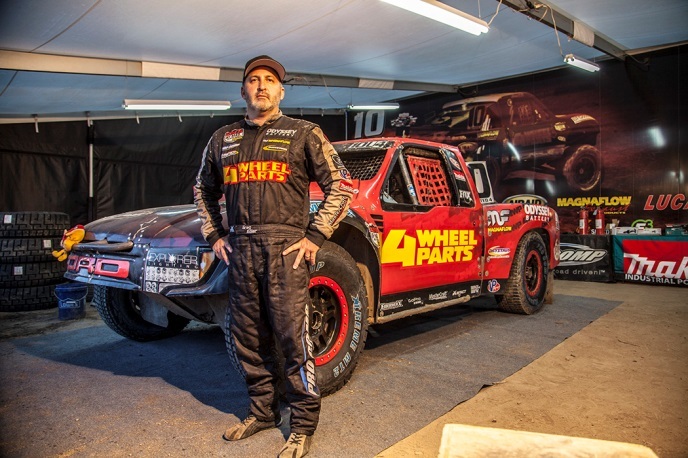 While serving as President and CEO of off-road aftermarket retailer, 4 Wheel Parts, Adler competes in the elite Pro 4 division for 900 HP, purpose-built, four-wheel drive trucks in the Lucas Oil Off Road Racing Series. In addition to their sponsorship of Adler’s competitive off-road pursuits, Daystar has maintained a strong connection to Adler and 4 Wheel Parts since 1994 as a key supplier of suspension, truck and Jeep accessories to their retail outlets. Complementing his position at the helm of the world’s largest retailer and distributor of off-road aftermarket and performance products with competing in the high-intensity arena of short course off-road racing, Adler has developed partnerships with an impressive roster of corporations who utilize the sport to reach potential customers. The 2015 18-round Lucas Oil Off Road Racing Series season visits California, Arizona, Nevada, Utah, and for the first time ever, Ensenada, Mexico. Follow all the Greg Adler Motorsports action at Team4WheelParts.com. Lucas Oil Off Road Racing action is broadcast throughout the season on CBS, the CBS Sports Network and MAVTV. Daystar Products is a leading manufacturer of suspension components and polyurethane products for cars, trucks, and SUVs. Daystar’s extensive product line includes over 400 Lift & Leveling Kits, high-performance Bushing Kits, Motor & Transmission Mounts, Scorpion Shock Absorbers, Winch Accessories, unique interior Dash & Switch Panels, and much more. Daystar Products was established in 1977 and has always been family owned and operated. All of Daystar’s Products are proudly manufactured in the USA. For more information on Daystar Products, see www.daystarweb.com. 4 Wheel Parts is the global leader in off-road truck, Jeep and aftermarket performance products. With 69 locations across the U.S. and Canada and growing, 4 Wheel Parts Service Centers install all the products we sell. Maintaining the nation’s largest inventory of off-road tires, wheels, lift kits, and accessories, 4 Wheel Parts serves customers across the country and around the globe. Life is Better Off-Road™. Visit us at 4wheelparts.com or call toll-free 877-474-4821.